Amazingly, it's been over 15 years since Blur frontman Damon Albarn and artist Jamie Hewlett unleashed Gorillaz on the world. The project started a cartoon band that could exist as avatars for their creators, while also doubling as a sly take on pop stardom. However, the original concept faded away as Gorillaz became an outlet for Albarn & friends collaborations. The last Gorillaz release was the forgettable, somewhat slight The Fall, which Albarn recorded on his iPad primarily by himself while touring Plastic Beach. But on Humanz, Albarn doubles-down on his special guests and gets even further from his old friends 2-D, Murdoc, Noodle & Russel. Albarn has put forth an increasingly gloomy worldview on his recent material (check out his solo record Everyday Robots or "There Are Too Many of Us" from Blur's comeback record The Magic Whip). On Humanz, he juxtaposes this feeling against a hip-hop fueled dance party. By now, it's well known that part of his inspiration was to picture a world where Donald Trump won the election. Then when it happened, Albarn went back and cut out the more specific references to Trump on the album to make it a bit less on-the-nose. Humanz is overloaded with more special guests than ever. While De La Soul and Del the Funky Homosapien were expertly deployed on "Feel Good Inc" and "Clint Eastwood," this record lets the featured artists run roughshod over the tracks. There are multiple songs where Albarn's voice is barely heard or isn't heard at all. The laundry list of guests on Humanz is overwhelming, with of-the-moment rappers like Danny Brown and Vince Staples, the legendary Mavis Staples and an array of up-and-coming, unknown performers all getting a crack at the mic. Some highlights include the mournful "Andromeda" and the loping rhythms of "Charger" (featuring Grace Jones!). Sociopolitical issues are top of mind on songs like "Let Me Out" and "Hallelujah Money." Then the record wraps up with a brief burst of optimism in the single "We Got The Power," with Savages singer Jehnny Beth wailing in the verses and a chorus that now-infamously includes a vocal assist from former rival Noel Gallagher, singing about having "the power to be loving each other no matter what happens." Humanz is chock-full of humans further pushing the cartoons out of the picture, but with so many voices, it's overstuffed. You'll be hard pressed to find more than a few memorable songs that really stick with you. Albarn feels like a party host, popping in and out of the conversation but also happy to make sure his guests are having a good time. This turns Humanz less into a cohesive Gorillaz album and more of a cool, curated playlist. Gorillaz return to Philadelphia for a very sold out show on July 13th at Festival Pier. 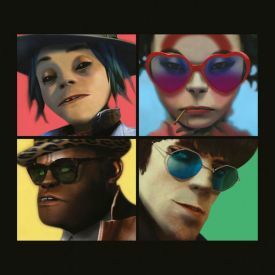 **Donate $20 or more to Y-Not Radio this week to receive a copy of Humanz on CD. Click here for details.